Enjoy views outside the sliding glass doors while you dine. The master bedroom has a flat screen TV and is located on the upper level. The full bathroom features a shower/tub combo. 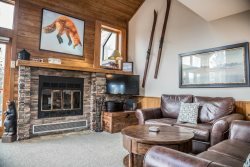 Caribou Highlands 510 is a 3 bedroom, 2 bathroom, ski-in/ski-out unit at the Caribou Highlands Resort. The kitchen is spacious and features granite countertops and new appliances. Guest bedroom 1 has a queen bed and sliding glass door leading out to a small patio area. Guest bedroom 2 has two twin beds. The living room features a flat screen TV, gas fireplace, and large sleeper sofa. The open living area is ideal for friends and family. The living room area flows into the dining room area. The unique wood dining room table adds to the charm of this ski villa. There is seating for 6, or up to 8 if you squeeze together, on the bench at the dining room table. There is seating for two more at the kitchen peninsula. This room includes an attached full bath. Kitchen appliances include an electric stove and dishwasher. Enjoy great views from the kitchen, through the dining/living room, and out of the sliding glass door. Though it`s in a sleeping loft, this master bedroom has plenty of privacy thanks to a glassed in window looking down over the living room and a pocket door at the staircase. This room has a flat screen TV. Enjoy great views out of the sliding glass doors in guest bedroom 1. The lower level bathroom has a shower/tub combo. Enjoy the private deck with a gas grill off of the dining room area Seating available seasonally or if you want to dust off the snow. Great views of the Lutsen Ski Hill from the deck. Caribou Highlands 510 is located within the Caribou Highlands resort. Unit 510 is located a short walk or drive from the main lodge. Ski-in and Ski-out from the access trail that goes right past the resort. Caribou Highlands Ski-In/Ski-Out Path. Back view of the private deck area off of the living room. Caribou Highlands is a great winter destination because of it`s proximity to the ski hill, but also a great place to visit in the summer months. There is a children`s playground just a short walk away. There is both an indoor and outdoor pool, with the outdoor pool being available May through October. Take a plunge in the heated indoor pool. Soak in the hot tub after a long day of hiking or skiing. Or play a game of ping pong. Work out in the fitness center. You'll love this "home away from home" on Lake Superior's North Shore! Caribou Highlands 510 is a 3-level ski-in/ski-out townhome located in the Caribou Highlands Resort. The cozy townhome is the ideal getaway for a weekend ski trip or a summertime home base for your Northwood explorations. Caribou Highlands 510 has 3 bedrooms, 2 bathrooms, and a cozy open living area. The kitchen has been remodeled with granite countertops and new appliances. You'll love curling up in front of the gas fireplace in the winter or grilling up a rack of BBQ ribs on the gas grill in the summer. Allergy Warning: While this unit is not pet-friendly for guests, the owner does have a pet. While we always do our best to clean after a pet stay, guests should be aware that there may be pet hair/dander present. This was our 1st visit to Lutsen. The townhouse worked out great. Plenty of kitchen supplies, bedding, etc. The only concern is the temperature fluctuation in the lower level. While trying to sleep, it would be rather warm, then rather chilly. Very nice. I was so impressed our 1st morning our baby woke up with a dirty diaper. I just set it out side to take it after all of our family had breakfast . I went out to get it and maintenance picked it already! So thank you!! Have always had positive experiences with rentals throughout the 15 yrs we have used them. Great location for Fall Superior Trail Races. We were unsure if we were operating the grill correctly and after calling the office had a couple of gentlemen spot by within minutes to help. Thanks! Very clean and had a nice location with all the trails nearby. Liked the close access to the pools, firepit and lodge/restaurant. Loved the salt water heated outdoor pool! (The best feature!) Was really looking forward to using the spa but it was closed. Appreciated the grill on the deck and the seperate master bedroom away from the other two. Great gas fireplace and cozy feel of the home. Your team members are great! They are always very helpful and able to get us into properties that we enjoy. Thank you! Lots of dust on fans and cobwebs, very minimalist in decor, and dishwasher needs to have the filter cleaned. Location was great, beds and linens good. Plenty of room and we enjoyed our stay.